Mumbai, June 1: We all know about our organs but if someone says that a new organ has been added to your organ list the? The interstitium is your newest organ. Scientists identified it for the first time because they are better able to observe living tissues at a microscopic scale, according to a recent study published in Scientific Reports. Scientists had long believed that connective tissue surrounding our organs was a thick, compact layer. That’s what they saw when they looked at it in the lab, outside the body, at least. But in a routine endoscopy (exploration of the gastrointestinal tract), a micro camera revealed something unexpected: When observed in a living body, the connective tissue turned out to be “an open, fluid-filled space supported by a lattice made of thick collagen bundles,” pathologist and study author Neil Theise told Research Gate. This network of channels is present throughout the body and works as a soft, elastic cushion, protecting the organs from external shocks as the body moves. Theise suspects the sampling procedure used to make slides, previously the only way for scientists to inspect the tissue in detail, did change the specimens’ shape. “Just taking a bite of tissue from this space allows the fluid in the space to drain and the supporting collagen bundles to collapse like the floors of a collapsing building,” he said. 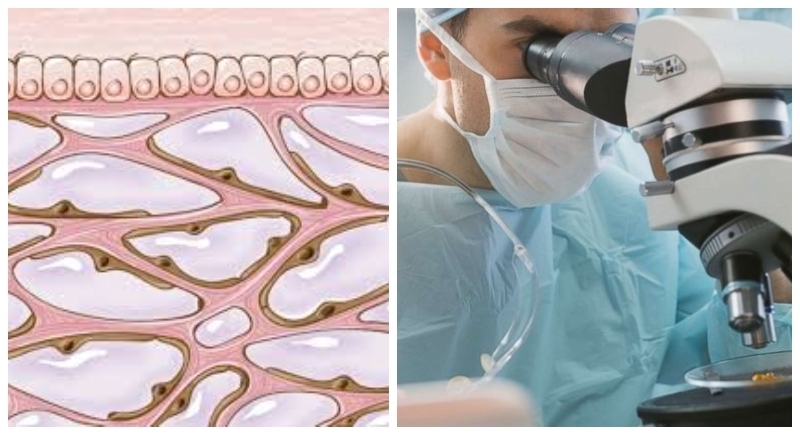 With further analysis of the fluid traveling across the interstitium, the researchers hope they may be able to detect cancer much earlier than they can today.